"New York Rangers will meet either the defending Stanley Cup Champs or San Jose Sharks for the finals this season." etc, etc. - Hockey News, TSN, Sports Illustrated - you name it. Tonight's display of hockey at MSG was a sad realization that all Rangers fans will need to come to terms with. Not sure if our coach, management or players on the ice see this direction. Our offense is the least scoring in the entire NHL (15 goals in nine games), and not one All-Star player on the ice has scored more than two goals. So basically, everything we thought pre-season was/is wrong. We have no cap room. We've paid too much for our free agents to allow for any viable trade. Not only are we seeing almost no production from both Scott Gomez and Chris Drury, they seem to be having a negative effect on the rest of the team. Henrik Lundqvist, goalie of NYR, should never leave the net - as he is almost entirely responsible for the turning point second Toronto goal tonight, as he shuffled behind the net for a loose puck, suddenly realizing he was out of position to lose the goal. This was perhaps the weakest game for "now-Prince" Lundqvist. Game over. A complete breakdown for all on & off the ice, and for those of us that still care. Tom Renney, coach of the Rangers, has instituted a fully defensive system to address the pre-season need for stronger blueline, almost validating the Jagr-friendly perimeter zone offense - which obviously does not work. Anyone listening? It does not work, Tom! We are not scoring goals. We are not winning games. We are now 3-6-1 going into the Tampa Bay Lightning game on Monday night. We're back in 1998 folks! Thank G-d for you! I was reading some other blogs abut tonights game and I was starting to feel as though perhaps I watched a different game. This team can't win! They can't score because they don't play a style that generates meaningful chances. Drury and Gomez haven't played well because they have NO ONE WITH COMPLIMENTARY STYLES to play with. If the defense isn't PERFECT the opposition has a field day. And Renney is way too soft on his players. Remeber 93-94, the Rangers started slow and then Keenan broke his stick over the net (or was it a players head?!?!) they lost the next game but they went on a tear after that. It's nice for Renney to protect his players, but come on. Pathetic. THAT means a lot coming from you, Rabbi! To be critical at this point is an understatement. Like you, I feel there is this vanilla approach to what I'm reading about the Rangers as well, as if there's plenty of time to make up for it through the season -- I've heard it from die-hards "Just wait until December...", but I am afraid we are at a critical turning point NOW! If we drop three of the next five games, we will be so far out of playoff consideration that no one, including Emperor Jagr, will be able to turn it around. Tom Renney is in the hot seat, so don't be surprised when we show up to the Garden with a new coach after the New Year. And a side note: Shanny is over. Sad. the dark ranger-Great minds think alike. See my last post and listen to my interview on nyhockeytalk.com or on my site. Its 1997-98 all over again. Dark, you say it like it is. However, is it 1997-98 all over again? Well I will be one to take a different approach and be one of the diehards that say RELAX. Usually I am a pessimist but right now things are just mixed up. We struggled like hell several times last season until going on that magical run to make the playoffs and this season we won't have to wait for March for Avery to come back and spark the team. Once Marty comes back he will bring the comfort zone that Jagr needs and we will be ok. So stop and breathe for a second. It isn't like we are 0-10; yes there were losses that easily could have been wins but the Cup isn't won in October. I entirely disagree with you TDR that Renney is on the hot seat already. He took the team and improved it each year post-lockout. If this team fails to make the playoffs, then he may be canned but certainly not before the new year or even within the season. I agree with the Rabbi in that Drury and Gomez have different styles but it isn't like they have played with regular linemates for more than a game at a time. RELAXXXXXXXXXXXXXX. When all is crumbling around you, we could all use a little Sootty Hockey!!!!! Good for you. Hopefully someone here will second the motion after tomorrow's game. OK, I'm taking the middle of the road. I think certain things that this team has done is inexcusable, such as the breakout of the defensive zone (thanks in large part to Rozsival and Mara) and the terrible blind and forced passes. (Did Gomez pull that in NJ?) At the same time, I agree with Scotty that it is still early and I don't think you can get rid of Renney just yet. To me this is almost a Herb Brooks type of sentiment (not in his coaching ability, merely the situation) Renney has put in a successful formula and game plan and when it finally comes around, it will be successful. 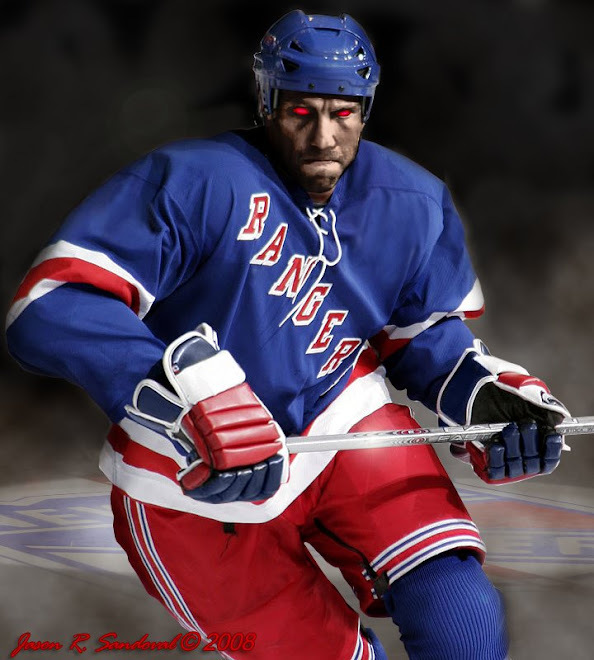 Still, the Rangers need a puck moving defenseman to help with the transition. ..and not unlike a Ken Hitchcock situation in Philadelphia Flyers last season. Great coach and is turning around the Blue Jackets, well...sort of, but my point being is that the Rangers could be suffering from a huge spell of BAD LUCK! I just want this team to rock 'it into victory -- if we lose another against Tampa Bay in the same form, then it validates the way we all felt after Saturday night's game.